The postcard was published by H. Sergeant of Ladbroke Grove and the photograph would have been taken on the occasion of his visit to Clement’s Inn in 1910/1911 when he also photographed Mrs Pankhurst in her office. Christabel’s room – or at least that section of it in shot – betrays little of the homeliness that her mother had added to hers – although there is a vase of flowers on the desk. Behind her is a bookcase filled with serious-looking books – as befits a lawyer – with a page from Votes for Women pinned to it. 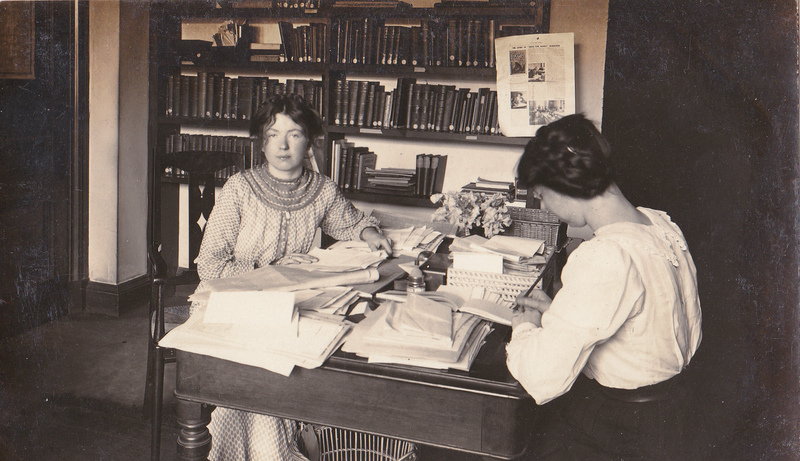 While Christabel looks directly at the camera, her young secretary keeps working, bent over her notebook, pen in hand. This entry was posted on October 6, 2015, 9:08 am and is filed under Collecting Suffrage, Suffrage Stories. You can follow any responses to this entry through RSS 2.0. You can leave a response, or trackback from your own site.